It’s raw, honest and difficult to read, but a confession like this feels better than through the human support network, which can overwhelm Coco. “I go to the page because no one knows who I am. They actually seem to care about a human life,” they tell The Tab. Time after time, someone like Kyle will respond. Posting paragraphs of advice under pretty much every post, he’s not claiming to be an expert. “Having gone through that physical and emotional pain myself, I told myself that if I could help it, I wouldn’t allow others to feel the same,” he says. Sometimes there’s a resolution – another post, comments underneath from people who have helped. Most of the time, though, the results of posts like this are never known. It’s become a familiar sight for anyone scrolling on their confessions page – Durfess, Oxfess, Bristruths. Every major uni has one, but they were meant for banter, talking about clubs, or telling someone in the library you fancy them without having the balls to say it to them. 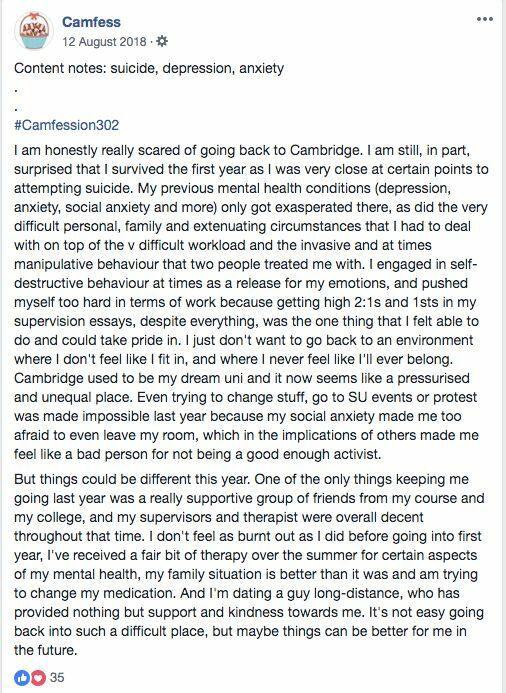 Now, Coco is one of many students turning to confessions pages on Facebook to try and mental health support. It’s become widespread. 15 per cent of confessions on Exehonestly are mental health related. During last Summer’s exam period, Bristruths were receiving 10 mental health related confessions every day. And nobody quite knows how to deal with it. 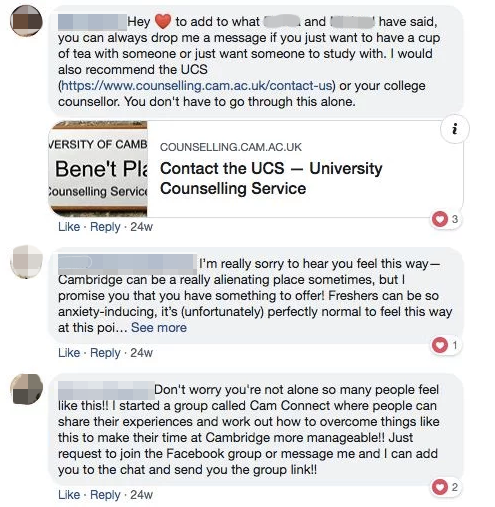 Unis are reaching out on the confessions pages to offer support. Untrained students are having to work out mental health policies on the fly, and people scrolling Facebook are ending up giving out advice to people they’ve never met. The Tab spoke to confessions page admins, psychiatrists, people working in mental health services and closely with the university, as well as people who post and respond. This is what we discovered. What do you do when someone reaches out with legitimate threats of suicide? That’s a big question, and one being left to the admins of the pages – students, not trained professionals. It’s bigger still when you have to decide whether to post it in front of thousands of other students. Running pages with thousands of likes, confessions page admins are entrusted with the gossip and inner thoughts of their peers. Yet they’re a mystery on campus, and every admin we spoke to didn’t want their identity revealed to their fellow students. Since the first posts calling people in the library fit, pages have grown into mini businesses spawning club nights and rivals. With this growth, however, has come an ever-increasing volume and seriousness of submissions. Posting the confessions on Facebook is almost a given. A UCLove admin told us: “I would personally feel guilt if did not post these confessions.” But the issue is how to help beyond that. All the pages we spoke to are unable to see who has submitted posts. Admins can’t intervene regardless of how distressing a post may be. In the face of that, many are putting systems in place to filter posts. Uni-Truths sprung from Bristol’s Bristruths, and now run 19 confession pages with a total of 200,000 likes. The admins didn’t want to be identified as they’re still students. 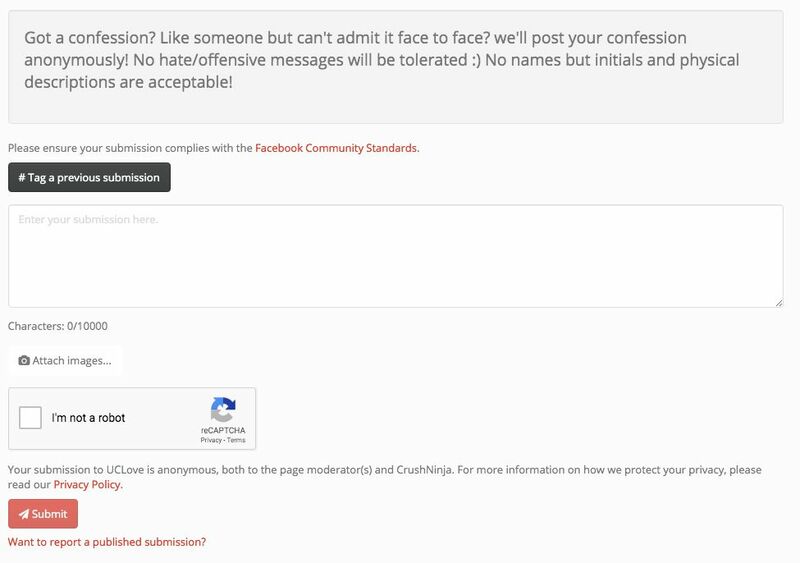 Users submit a confession anonymously before it is approved through the website and posted on Facebook. “When the posts started getting difficult, we built a feature into the site that flags up words related to mental health or suicide,” a Uni-Truths admin told The Tab. The system detects this content, asks the user whether it is suitable for the student moderators to read, before listing available help and mental health services. Uni-Truths say that since this change, posts relating to mental health have decreased on Bristruths. UCLove use a website called Crushninja. If admins are unsure about a confession, they have 24 hours to vote on whether it should be posted. TrUWE have also considered a new system that would enable them to see the identity of someone whose post was particularly distressing, they told The Tab. Most pages also have pinned posts detailing where students can get support. The admins of Leedsfess say they’ve come under fire for just “posting a bunch of links” and accused of “fobbing people off.” However, one admin said it’s difficult to achieve a balance. “We’re just students ourselves and don’t have any expertise in terms of helping people to deal with their mental health issues, so posting a bunch of links is really all we can do when people submit something to us anonymously that we find concerning for them,” they said. 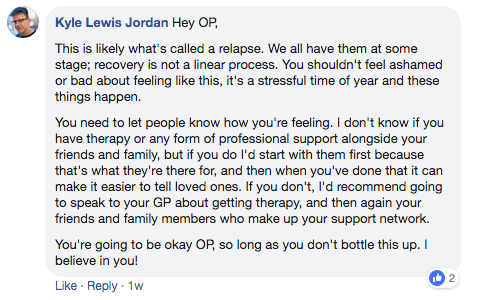 Still, despite the criticisms and worries over whether they’re doing the right thing, the admins come back to the overwhelming feeling that the mental health posts are constructive. Camfess, the confessions page at Cambridge, believe it to be their duty to give everyone an opportunity to be heard. “People engaging with the page are often helpful, compassionate, not least because often they’ve been through similar situations themselves,” said an admin of Camfess. An admin at TrUWE takes the responsibility in their stride. They told The Tab that it may be the case that confession pages possess the key tools in addressing mental health. “I think it’s a very difficult subject but that’s what makes it more important to tackle,” one admin told us. “It would be nice to do more, but as students ourselves we have not the time nor resources to support people,” they told The Tab. If that’s as far as the admins can go, who can actually help? Uni services are getting involved, posting info on the pages and talking to the admins. In Leeds, you’ll see posts from Nightline pointing out their services. At UCL, the uni’s support services have taken to actually posting their own confessions. Posts on UCLove are concerning the uni, says Denis Long, UCL’s Director of Student Wellbeing. 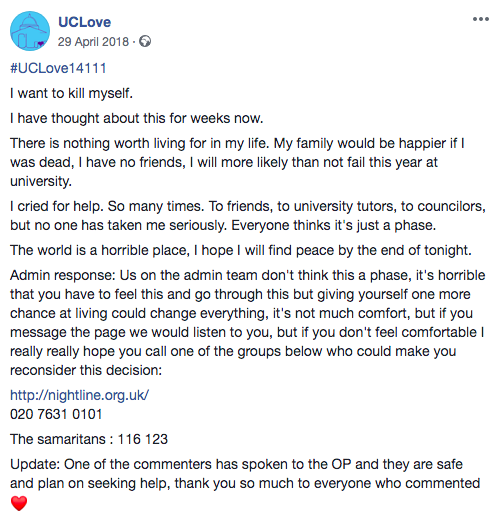 “While this page is not officially affiliated to UCL and we cannot verify the comments, we have been working with the page’s administrators to make sure information about UCL’s Support and Wellbeing services are visible on the page” he tells The Tab. But to actually engage with a post is something more. 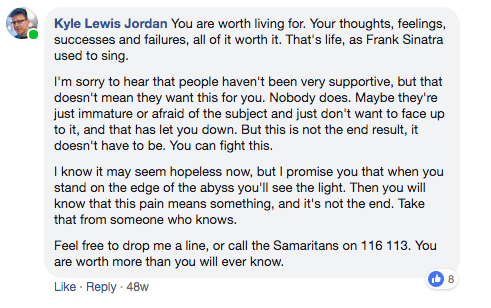 Kyle Lewis Jordan regularly comments on UCLove with paragraphs and paragraphs of advice. He’s not the only one. But why does he do it? “So long as I continue to be helpful, I’ll continue to weigh in when I can,” Kyle says. And he is. After posting on UCLove, Coco has spoken to Kyle directly, and says it helped out. “It’s good to talk to someone like him because he really does understand what I am going through,” Coco says. Even without talking directly to someone, seeing the comments can be enough. “On the times where I’ve waited for my confession to be posted, I’ve read the comments and not made an attempt on my life,” Coco told The Tab. You won’t see a post about suicide without students answering with genuine concern. Replying to everything, though, is impossible. What happens when people like Kyle don’t? Surely the burden of having to bear the responsibility of commenting on these posts may be too much for individuals. You’ll hear a lot about how social media might be harming young people’s mental health. Experts we spoke to think, however, that this use of confessions pages is one way social media can help. “Popular coverage of this topic overstates the damaging effects of social media,” says Allan House, Professor of Liaison psychiatry at the University of Leeds. 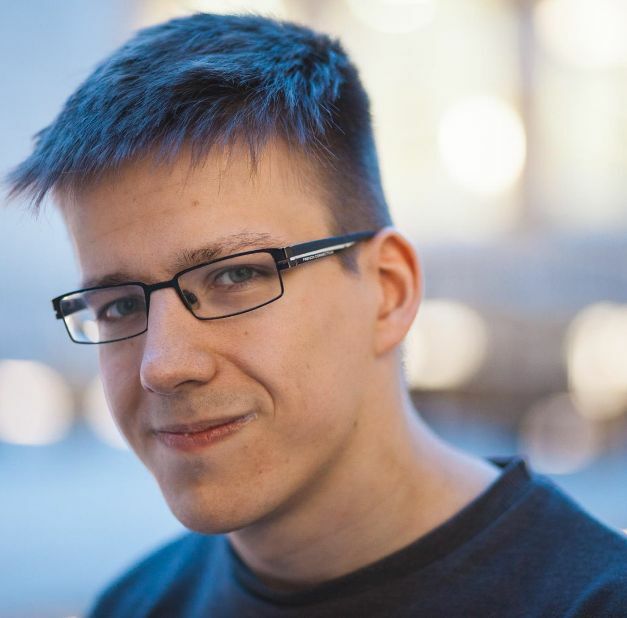 The long, text-based posts can even “encourage a slower and more thoughtful engagement, which is good, and sadly missing from much of the current media debate about mental health and self-harm in young people,” he tells The Tab. Confessions pages give people a forum, like Coco says, for sharing anonymously, in a non-judgemental way, and being given practical advice. They often don’t seek this otherwise, according to House. “Between a third and a half of young people who harm themselves don’t tell anybody in their family or immediate social network,” he says. “A start in the relatively safe space provided by confession pages may help in itself and it may get somebody on the road to confiding in a friend or professional,” he says. And the bulk of comments do this. Going beyond feel-good advice, they point students towards uni services and peer groups. Anonymity also has benefits beyond the initial decision to reach out. “Some conversations spill over into topics that it’s difficult for students to talk about otherwise -concerns about sexuality or gender identity, social and familial expectations and so on,” says House. It might be nothing new, a kind of “modern version of an age-old phenomenon, the desire of those in trouble to feel connected in some way to others who might understand and help,” House says. Admins are aware of these benefits. “Sometimes they may feel that being anonymous, they can express their thoughts without the judgement of others,” a Nottsfess admin says. It’s still no replacement for getting actual, professional help. The experts we’ve spoken to all agree that’s one of the more important things pages can do. Founder of “Attention Seekers?”, Satveer Nijjar is a trainer and speaker who seeks to raise awareness of mental ill health and self-harm. She believes that the use of confession pages in this way could be positive, but that professional support is also needed. Supportive comments “can give them hope and may even encourage them to access the support that is suggested,” Nijjar says. In his statement, UCL’s Denis Long went to lengths to detail the uni’s services. Nobody really expected confessions pages to turn into a place where students seek support for their most intimate problems. Perhaps even more unlikely was that admins would have to figure out their own mental health policies, people liking the page would have to give support, and unis would have to figure out how Facebook plays into the bigger picture. But experts and admins agree the pages are helping. Crucially, on a personal level, the impact of confession pages cannot be understated.